This is our third spring in Washington, and my third time going to see the tulips. The first time I went was for my 30th birthday, and I went with five girlfriends (and my very pregnant belly). Last year I dragged Tim and the girls along with me on a beautiful sunny day. This year I went with a friend and her two kids. It was cold and windy and a completely different experience than my last two years! So I have some tips for you. 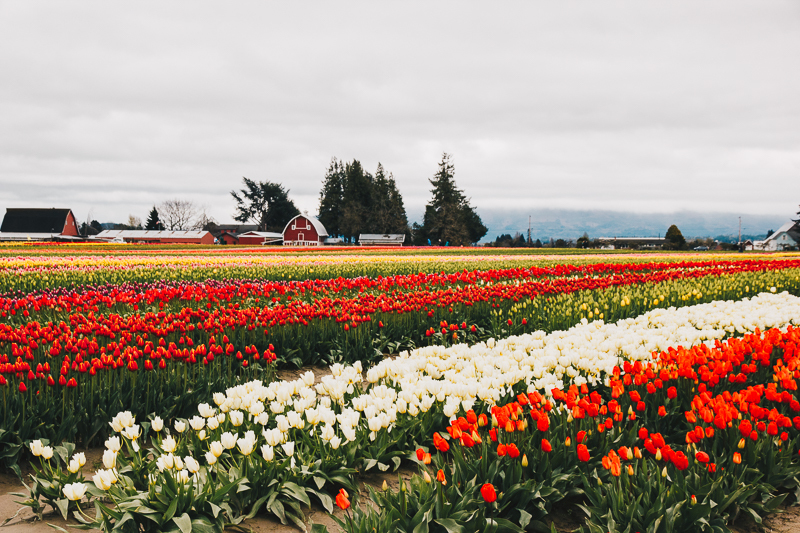 Chances are that if you live in the Seattle area and have done any minimal amount of research about tulip fields, you have seen these two names come up. 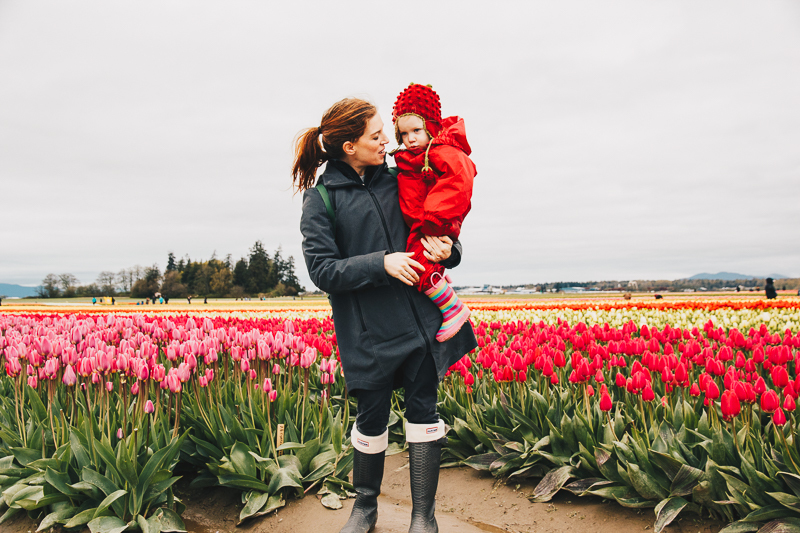 Last year we went to Roozengaarde and this year we went to Tulip Town. I prefer Roozengaarde in nice weather because there’s a really nice garden near the parking lot where you can take beautiful pictures of your toddlers without needing to walk through the fields. However, there is quite a bit of walking you’ll need to do. Tulip Town is nice because the fields are closer to the parking lot and there is an indoor display of tulips, which is nice on a cold/rainy day. I almost want to advise not going on a Friday, either. When I went on a Saturday two years ago we waited in tons of traffic for an extra hour (or more!) just to park and go see the tulips. Last year we went on a Friday in nicer weather and there was traffic but nothing memorable. 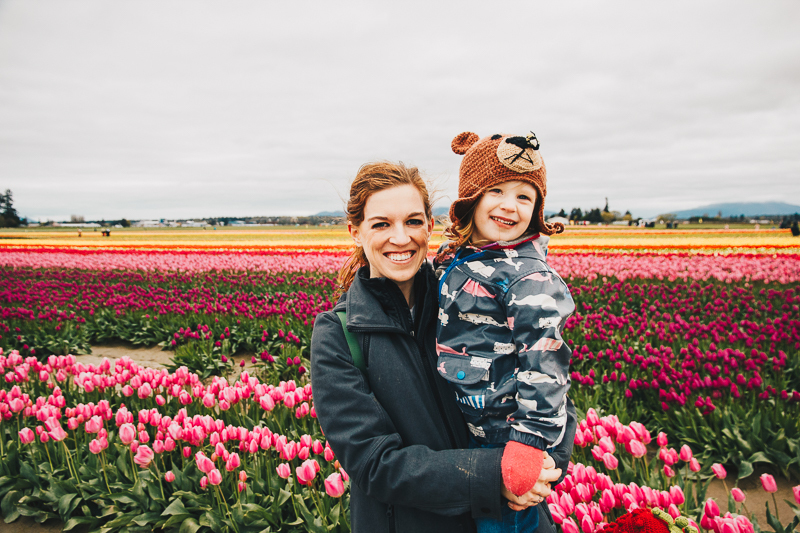 This year, again on a Friday, we left Seattle early and cruised right into the parking lot of the tulip fields without ever needing to stop and wait for other cars. The last two years when I visited the fields in the sunshine the crowds were bad and so was the glare in my pictures! The fields photograph better on cloudy days, and there will be much fewer people around you if there’s a little rain or wind in the forecast. I will caution that this year I heard a lot of “I’m cold! I want to go home!” from my toddlers, but honestly we go to the fields because I love them, not because they do! If it was sunny they would have been whining about something else. 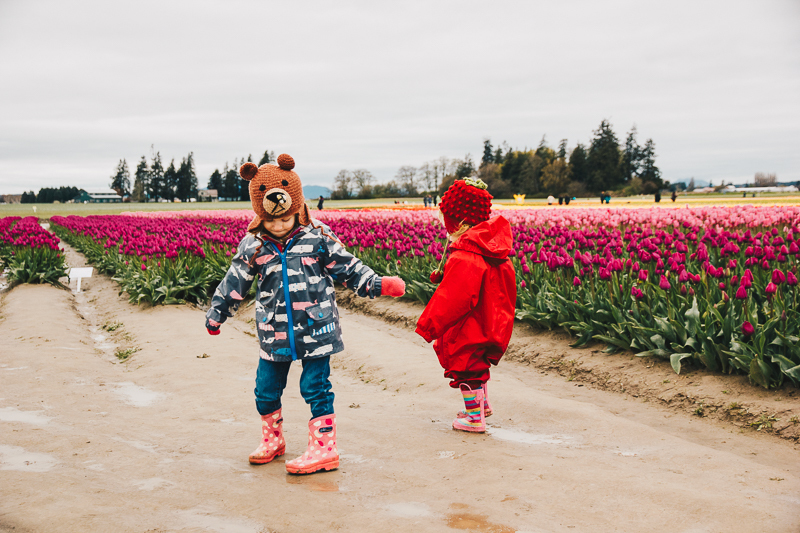 Even if it’s sunny, bring rain boots and rain jackets because there will probably be mud if there was rain in the last few days – and since this is spring in the PNW, there will have been rain! Also, bring a change of clothing – for everyone! 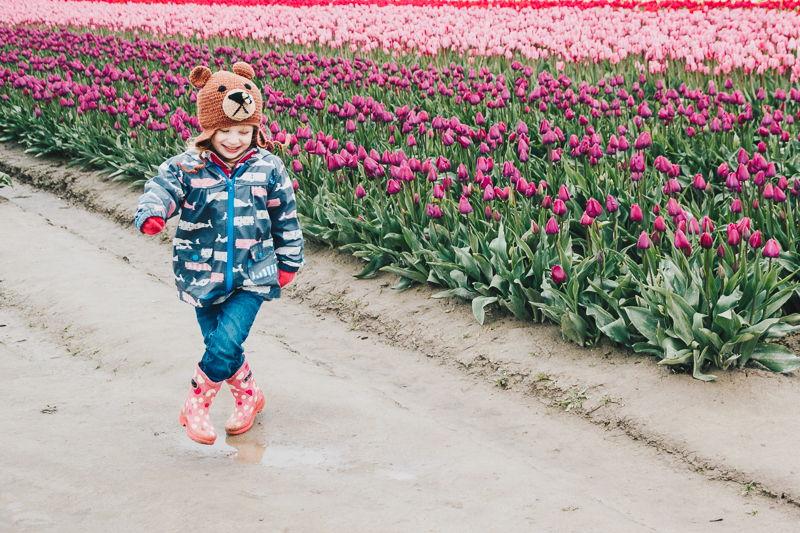 Last year, like the naive and hopelessly optimistic parent I am, I dressed the girls in cute outfits, hoping to get one good picture of them in the tulips. Well, of course, Clara lasted about 10 minutes in her adorable dress before she wiped out in a mud puddle. Did we have a change of clothes for her? Nope! So this year I brought extra shoes and outfits for everyone, and we were able to get into clean outfits before going out to lunch. Trust me on this one, if you bring a stroller it is going to get stuck in the mud immediately! If you have a baby, put them in a carrier. If you have toddlers, try to bribe them to keep walking. Let’s be honest, seeing flowers is not the most fun activity for most kids. However, I personally love going to see the colors and to try to take some pictures and to get out and do something outside of the city with my family. If you go into it with the expectation that you may be the only person who enjoys the experience, you’ll probably leave feeling more satisfied that the outing was a success! 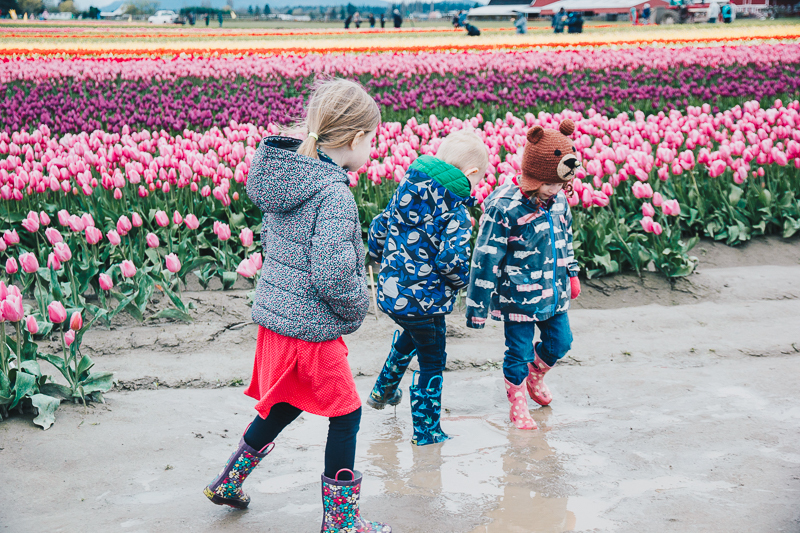 I fully intend to keep dragging my kids to the tulip festival every year. I think it’s such a fun way to spend a day! This year it was extra-fun because my friend and I drove up to Mount Vernon together and had some quality talk time in the car to talk while the kids entertained each other. Win! We also went out for lunch at Calico Cupboard in La Conner, which is a long wait, but has great food and atmosphere for kids. Because we were feeling extra generous, we even let our little ones play on a small playground near the main street of La Conner, which they would probably agree was the best part of their day! 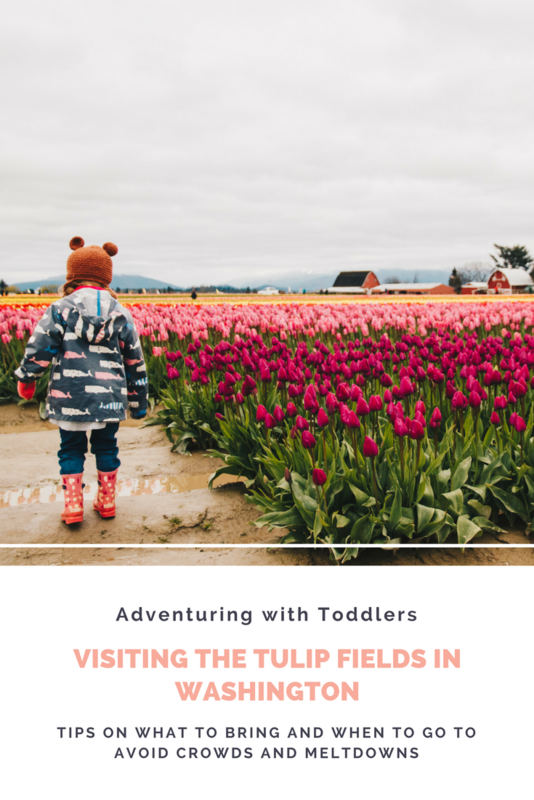 This entry was posted in adventuring, seattle and tagged adventuring, toddlers, washington. Bookmark the permalink. Man, those fields are SO beautiful! I’m impressed that the tulips are blooming so beautifully in Washington – I’m sure we’re weeks away from that happening here. The daffodils have only barely started to come out! But I suppose that’s what happens when the mercury can barely crack 40 on any given day. We’ll be getting our spring flowers in June this year! Haha. They are really gorgeous right now! Although daffodils were in bloom too, so maybe we’re a bit later this season? There’s never spring in the midwest, just winter to summer! Awww thanks! I’m glad we went for sure!! I hope they have memories… or at least appreciate the pictures later in life! these colors are INSANE! totally worth the pictures! !